35 Years Ago Today. Bill Fitt's Golden Spike - The Home Machinist! 35 years ago today was the golden spike on Bill Fitt's Lake Meauwataka and Wildwood Railroad. 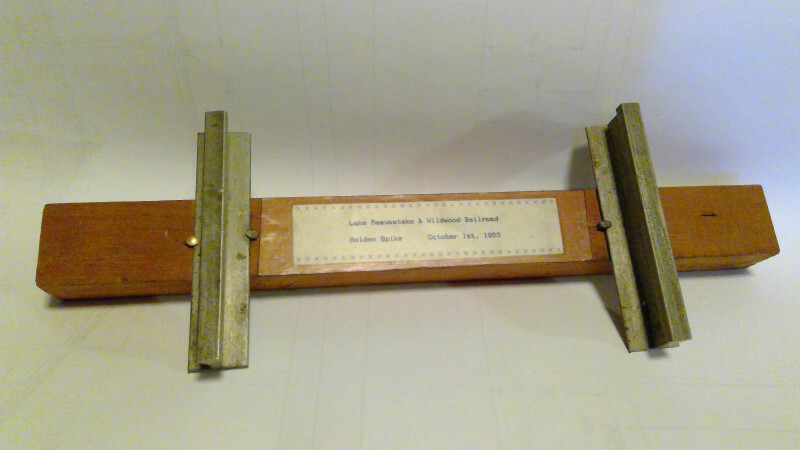 The photo is a tie with two rails from the ceremony that Bill kept it as a memento. nestled in the woods close to Lake Meauwataka near Cadillac, Michigan. Bill passed away before I had any opportunity to meet him. His son Paul left all of us too soon as well. Bill's effort toward concrete ties was quite commendable. And, in many ways... still is. conversation related to the track set up and the stories told... that never appeared in Modeltec. Some of you may remember Paul's magazine construction article devoted to a Jordan Spreader. right-of-way, they piled more snow on the track to run the spreader again. I asked, "I don't recall reading anything about that in the magazine." Paul's reply was, "And you're not going to", as everyone laughed. Where is the ceremonial tie today Pat? After Bill passed and Doris was getting ready to move to the Dakota's with Paul she gave the commemorative tie to my dad. I've got it along side the Acorn Junction station sign from Harry Herder's railroad. Three pieces of Bill's equipment were at the Tri-State meet at Bill Pepper's in September. The Rittenberg hopper, a Koster gondola in the Rock Island blue scheme lettered Rock Valley (Herder's railroad) and his Morris switcher. I came across an old Modeltec with a meet report from the mid-80's. 24 locomotives and 200+ people from three clubs at Fitt's. Larry Goldsby and some guys from the Great Lakes Live Steamers ran into the night once. They all piled into a panel van to head to Cadillac and ran out of gas halfway to town. This was before cells phones and they were looking at the long walk to town to get a gas can when one of them spotted a propane bottle in the van. They took the cover off the engine, rigged a hose into the air cleaner and started feeding it propane. It took a little practice but they got the van started and made it into town.